Recently the poetry community was struck with some terrible news. As a result of the bush fires in Kinglake our dear friend and sister poet Ella Holcombe lost both of her parents. We are holding a fundraiser here in Perth to support Ella. “Regenerate: The Greening of Kinglake” will be an evening of poetry and song, featuring poets such as Kevin Gillam, Andrew Burke, Lucy Dougan and Sarah French, together with a silent auction of donated goods. I will be reading at the fundraiser and would love to have your company on the night. As suggested by the venue and timing, this is an event for adults, rather than children. 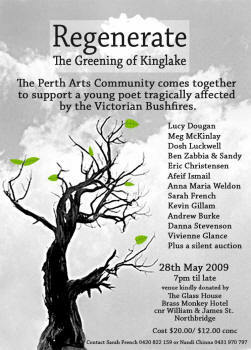 This entry was posted in Events, Poetry on May 18, 2009 by Meg McKinlay.